The TR122 Transient Recorder is a high performance two channel transient waveform digitizing instrument in a single slot 3U Compact PCI module, capable of digitizing to 12 bits at rates up to 200 MS/s on each channel independently. 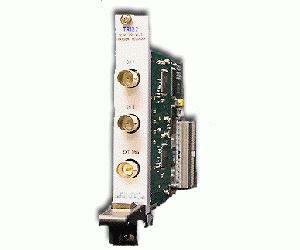 Each channel includes an independent analog front end and analog-to-digital converter, providing superior interchannel isolation and full bandwidth availability on all channels. The TR122 and included software provide a turn key transient measurement solution, while included software source code and drivers provide powerful system level integration options.